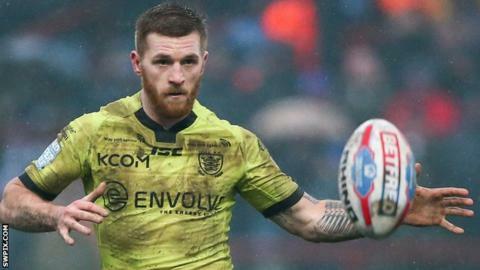 Marc Sneyd scored a hat-trick and kicked eight goals as Hull FC comfortably won at Huddersfield Giants. The visitors led 24-0 at the break through a brace from Sneyd and tries from Fetuli Talanoa and Albert Kelly. Kelly bagged his second after the restart and Josh Griffin and Carlos Tuimavave scored before Sneyd crossed for his third of the evening. Sam Wood and Oliver Roberts got consolation scores for the Giants in the second half. Huddersfield stand-off Danny Brough, who needs six points to move up to ninth on the all-time domestic points scorers list, missed both his attempts at goal. The dominant victory moves the Black and Whites up to second in the Super League table before the rest of the weekend's fixtures. Huddersfield Giants: Mason, Ormsby, S. Wood, Mellor, McIntosh, Brough, Brierley, Rapira, Leeming, Ikahihifo, Roberts, Smith, Hinchcliffe. Replacements: Wakeman, Clough, Dickinson, M. Wood. Hull FC: Shaul, Fonua, Tuimavave, Griffin, Talanoa, Kelly, Sneyd, Taylor, Houghton, Bowden, Manu, Minichiello, Thompson. Replacements: Connor, Green, Matongo, Washbrook.